D.J. Scheffler & Nye is the leader in the construction of subterranean coastline basements using innovative Continuous Flight Auger (CFA) Shoring techniques. There are few assets more precious than a home on the California coastline. However, the spectacular beauty does come at a price — very limited space. While many homes are very space efficient, filling nearly every square foot of the lot, limitations on structure height and small lot size still limit the ability to create a spacious home with room for storage, wine cellars, media rooms or recreational rooms — things that can turn a house into a home. D.J. Scheffler & Nye, Inc. has worked very hard to erase these limitations through the use of technologies that allow construction not just above ground, but also beneath the ground. The use of basements is common in many areas of the United States, providing an effective means of maximizing square footage on even the smallest of lots. However, in developed areas of the California coastline, basement construction has been all but impossible due to the unstable nature of the native soils and the proximity of adjacent structures. A typical home constructed in a beach community may have only a few feet separating it from the neighboring houses. In order to construct a basement in this setting, the soil would need to be temporarily vertically excavated until the basement walls could be poured. Given the propensity for saturated sands to cave and flow when excavated, traditional shoring systems used by others were generally too risky, as any loss of ground or significant vibration could lead to settlement and damage to the adjacent structures. Even after these systems were installed, it was typically necessary to utilize dewatering systems to allow construction of the basement floor. Unfortunately, significant changes in the water table can lead to settlement of the surrounding soil, the result often being damage to neighboring homes. D.J. Scheffler & Nye, a company specializing in shoring the most difficult of sites, understood the desire of their clients to include basements in their beach homes and invested significant resources into researching and perfecting a system that allowed that dream to become reality. The solution was to utilize a secant pile shoring system constructed using Continuous Flight Auger (CFA) technology. 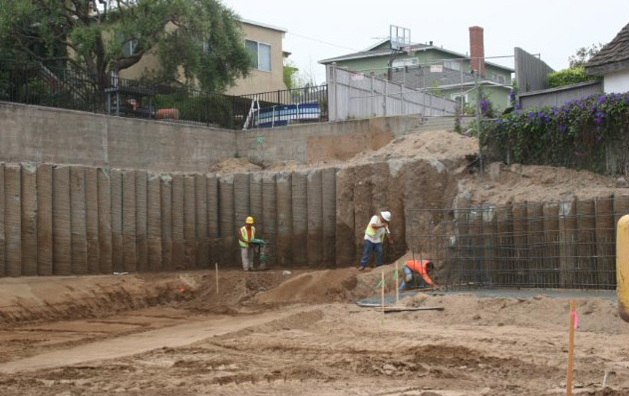 The secant pile system consists of a continuous wall of overlapping concrete piles placed around the perimeter of the site prior to excavation. The overlapping piles are installed using low vibration equipment and provide a waterproof structure that prevents ground loss during excavation. CFA is a method of constructing drilled concrete piles by advancing a continuous auger to the base of the shaft and placing concrete through the center of the auger as it is withdrawn. The most significant advantage of this method is that the concrete is placed under pressure as the soil is removed, ensuring that all void space is filled and no ground is lost during the operation. Secondary to this, the method also allows installation of the piling much more quickly than conventional drilling methods, reducing the overall cost of the project. By combining the use of CFA technology and secant piles, ground loss is limited not only during drilling, but also during excavation. Only after all pilings are installed is the site excavated, revealing a continuous structural wall. At that time, a concrete slab can be placed at the base of the excavation effectively sealing the site and eliminating the need for risky dewatering. D.J. Scheffler & Nye's dedication to providing the best quality shoring systems now allows what once was only a dream to become reality. Through the use of CFA secant piling shoring, D.J. Scheffler & Nye's clients can now build not just a house on the beach, but rather construct a home with enough room to fully take advantage of such a spectacular setting. Subterranean construction on California coastline properties is now an affordable and safe reality thanks to the CFA techniques perfected by D.J. Scheffler & Nye. Take a loook at some of our Continuous Flight Auger projects here.